In early spring, the first leaves of the tea plant are picked. Dried naturally, they transform into silvery white tea leaves. 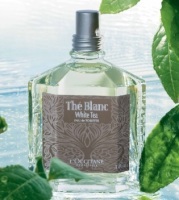 A clear infusion of white tea is a source of both freshness and strength. This delicate drink is offered to guests as a mark of hospitality and friendship. Other recent releases from L'Occitane: Rose & Reine, Cherry Blossom.